Four years ago, Google released what we know today as featured snippets. There were some bumps along the way, but last January, the search engine behemoth reintroduced the feature, promising easier and more accurate answers for users asking questions. The value of featured snippets has skyrocketed, and now it’s embedded in the vernacular of every SEO professional in digital marketing. It’s time your business joins the movement. A featured snippet is what appears at the top of the page of a Google search, in a featured frame, above the rest of the links on a search engine results page (SERP). We call this placement “position zero” because it’s positioned above the 10 results below. 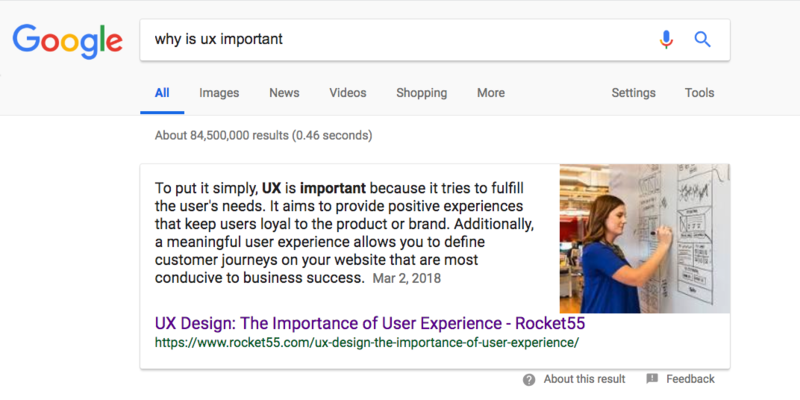 A featured snippet is highlighted at the top of the page because it’s what Google deemed as the best answer to a query asked in the search bar. The major benefit of a featured snippet is that it gets the top placement in SERPs, which takes up massive real estate on mobile. Say we search “why is ux important” in our Google search bar. A featured snippet will appear with an answer to our query by pulling the information from a webpage. 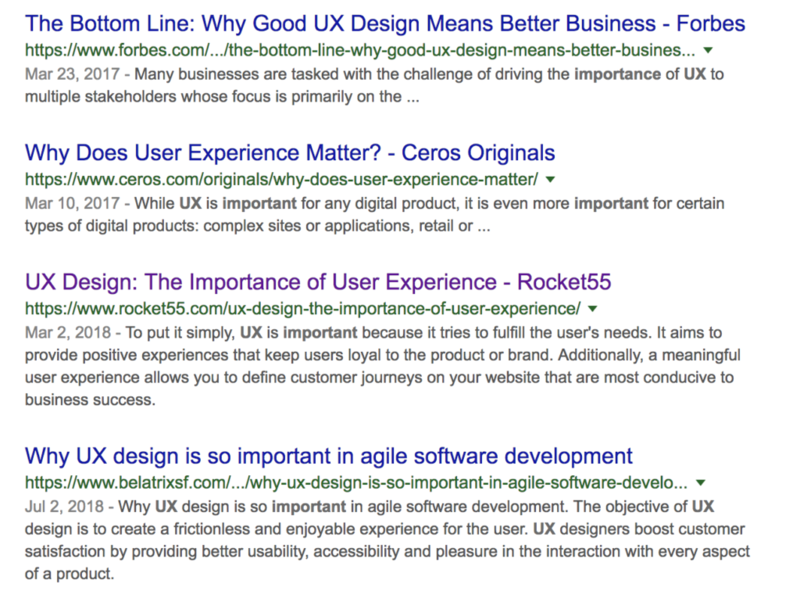 In this example, Google has pulled the answer from our blog about UX Design. The Google algorithm produced an answer from the third paragraph from our blog. Google also featured the link to the blog so readers can get more context around the answer. There’s also a photo from the blog of an employee drawing a wireframe. Hey, Alexandra, you’re famous! Featured snippets aren’t always a chunk of informative text and a link; they come in different varieties. Paragraph snippets, like the one shown above, are the most popular featured snippets. The snippet is taken from within the page’s content to directly answer a query in the search bar. List snippets are usually bullet points or a numbered list. These featured snippets often appear when Googlers search for the “best” or “most expensive” of something. List snippets also appear when searching for an explanation of a process or method like recipes and how-to guides. Card snippets are a close relative to list snippets. These featured snippets give you a scrollable card display with photos to questions like “how many dog breeds are there?” There are hundreds of dog breeds, and imagine the headache trying to explain what each breed looks like. 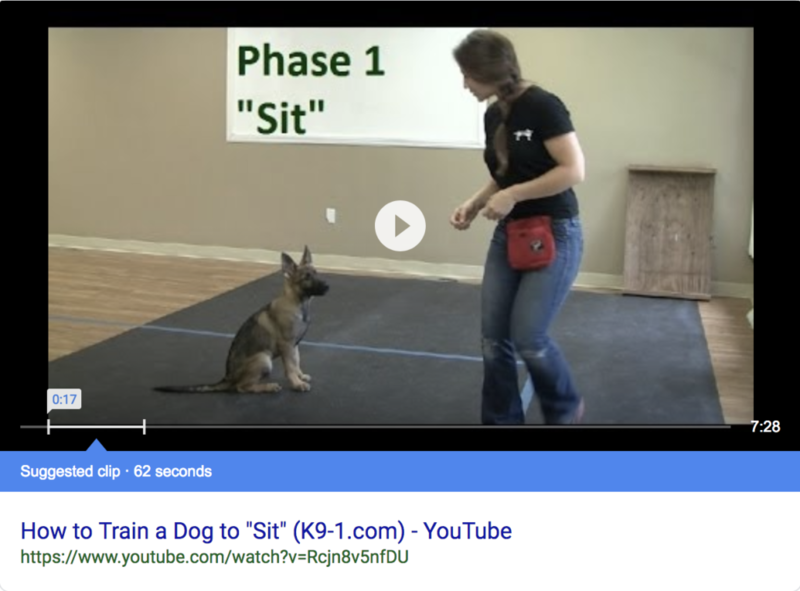 Instead, Google pulls an image of the breed to answer the query more effectively. Table snippets are the rarest type of featured snippets. When they appear in a query, Google is grabbing the HTML from the webpage to produce a feature table for themselves. More on HTML later. YouTube snippets are becoming more common by the day as more YouTube publishers upload content to the platform. Around 300 hours of video is posted on YouTube every minute, which creates a lot of competition for featured snippets. You should always optimize any piece of content posted on YouTube with segmented breakdowns of your video in the video description. This will help Google find the exact portion of your video that will answer a query. What Is the Value of a Featured Snippet? Featured snippets are insanely valuable in Google searches. Ahrefs performed a study of about 112 million keywords in the United States, and about 14 million had featured snippets in their SERPs. That’s more than 12 percent of search queries. There’s also some staying power if you gain a featured snippet. Google only changes the link to a featured snippet 50 percent of the time over a four-month span, while the battle for position one in SERPs (the first organic listing) is an ever-changing fight for keywords, as rankings are fluid and can change every day. Beefing up your content to appear on the first page of the SERPs takes time. Go back to our “why is ux important” example. Our link is ranking relatively well in the third position. Yet, our link also appears as the featured snippet. Getting that featured snippet is massively important when it comes to people clicking through to your site. 51 percent of all website traffic comes from organic search. Links in position one of searches are clicked 26 percent of the time. The third link is clicked 11 percent of the time. If there’s a featured snippet among the search results, the featured snippet link can take 7 percent of the clicks away from the top link in the search results. A link featured twice, in this case as the featured snippet as well as the third organic listing, increases the likelihood of getting clicks compared to the other search results. There isn’t a specific formula to get a featured snippet. You have to take a smart, targeted approach. You can start here with 4 steps to creating a page worthy of Google’s algorithm to be featured in position zero of a search query. The majority of featured snippets are sparked by long-tail keywords. The reason for this is because featured snippets are an attempt by Google to answer explicit questions like who, what, where, how, etc. Implied questions (does, cause, cost, etc.) also trigger featured snippets. There are several resources you can use for this research. Among our favorites are Moz Keyword Explorer and LSI Graph. Answer the Public is a tremendous resource because of the various questions that are generated from a simple keyword search. Try searching for a question you think a potential client would look for on Google. From there, use the handy “People also ask” box located under the search bar. This feature is filled with similar queries about the same topic. Step 2: What Does Quality Content Look Like? Quality pieces of content begin with appropriate topics on the service or product you provide clients or customers. You can get help building an outline for a post by using the “people also ask” tool we mentioned above. These questions provide great subheads for you to build the post around. Quality content is also readable. Proper grammar, paragraph length, bullet points, numbered lists and subheads all work together to create segmented and easily digestible content. Google was generous enough to drop their general guidelines for quality content on us last year. This will provide you with basic principles to follow when making content. Google reads the internet through the language of HTML, so there is a minuscule amount of code you need to know. Fortunately, there are tools on the internet that can transfer your text to an HTML format. If you’re asking a question in a subhead, format it as an h2 or h3. This could increase your likelihood of getting a featured snippet. Make sure you summarize the answer in a short, paragraph-length piece of copy directly under the subhead so it’s easily snippable for Google to use as a featured snippet. Once you have published a piece of content, don’t cross your fingers and hope Google deems it worthy of a featured snippet. Track the page’s performance through Google Analytics or Google Search Console. Nearly 99 percent of featured snippets have the link already appearing on the first page of search results. Your goal is to get on that page. Google Search Console is a smart way to track the long-tail keywords you selected for your content. You can track the keyword’s performance and if people are accessing your content through certain queries. There are hundreds of other ways you can improve your content’s position on Google. Featured snippets are vital when it comes to voice search. Try it now. When you ask Google Assistant, Alexa or Cortana a question, the response they give comes from a featured snippet. “Hey Google, what sort of fish is mahi-mahi?” The voice search device will give the source of the answer and the website name before reading the featured snippet back to you. By next year, 50% of searches will be voice searches. Will your content be there to answer? Need Help Getting Featured Snippets? Proper SEO and content strategy is going to increase your site’s chances of earning a featured snippet. It’s a time-consuming process with an endless return for getting eyes on your website. Get more visibility on Google and join us at the forefront of SEO.